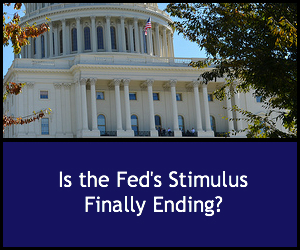 Is the Fed Finally Ending the Stimulus? Is it curtains for QE3? The Federal Reserve has announced that Quantitative Easing, round three, better known as QE3, is coming to an end – although key interest rates won’t rise until mid-2015. The end of the stimulus also marks the end of a massive experiment in government intervention that sparked debate both at home and abroad. Quantitative Easing entered the popular vocabulary in the tumultuous years after the housing bubble of the early 2000s burst catastrophically in 2007-2008. The housing market collapsed and so did other key sectors of the economy. To get things rolling again, the Federal Reserve stepped in with plans to buy up treasury bonds and mortgage-backed securities from financial institutions. That, they reasoned, would keep interest rates low and prompt consumers to buy homes and other big-ticket commodities. The scheme went through two rounds of intervention on a smaller scale before Version Three hit the scene in 2012. The plan was ambitious and not without risk. The Fed began buying up mortgage-backed securities at a staggering rate of $85 billion per month. The plan had no fixed end date; Fed officials said that would depend on the behavior of other key indicators of economic health such as employment. As a result of the Fed’s intervention, interest rates hit historic low levels – and stayed there with little change. Those rates did boost home sales, sparking a slow but steady upturn in the struggling housing market. Other consumer goods began to move as well. But the massive stimulus plan met with criticism from economists, financial experts and even some officials of regional Federal Reserve banks. Many feared that the government’s artificial manipulation of interest rates would backfire, and rates would skyrocket once the plan ended. Other concerns these and other market watchers raised had to do with the effect the plan would have on the dollar in world markets, and on US competitiveness in global trade. Still others worried that all the plan was doing was lining the collective pockets of big lenders, who weren’t passing on any of the benefits to their accountholders. But in the face of a weak employment picture and continued issues with foreclosed homes and struggling buyers, the stimulus stayed the course. Interest rates stayed low, the dollar went on a rollercoaster ride in world markets before steadying at competitive rates, and economic conditions gradually began to improve. By late 2013, as the Fed prepared to change chairs with the exit of Ben Bernanke, rumors of a “taper down” were in the air, though Fed officials remained coy about setting a date to start scaling back. When economic conditions were right, they said, they’d begin scaling back on the bond buyup. It wouldn’t do to quit cold turkey and put the economy’s delicate balance at risk. Finally, after a couple of false starts, the taper began in early 2014, as the Fed decided to trim $10 billion off the monthly buyup. That brought it down to $75 billion a month. That was followed by more incremental cutbacks of $10 billion each; with the Fed reserving the right to scale back up if economic conditions worsened. Along the way, many of the major criticisms of the plan were quashed. Interest rates rose moderately but still stayed low. And on the world stage, other countries trying more modest versions of quantitative easing in their own economies were still struggling while the US continued to rebound. The dollar stayed competitive, and the US still dominated global commerce. According to a recent Wall Street Journal report, the Fed itself maintains that it met its goals for QE3: reducing unemployment and getting the housing market back on its feet. And though the stimulus is headed for an end at an as-yet-unspecified date, Fed officials maintain that short-term interest rates will remain low for quite some time. How long? That isn’t clear, since the Fed maintains that all these decisions – including the one to end the plan entirely – are subject to change depending on the health of the economy. There’s no definite date to shut QE3 down, and the Fed’s report card for the plan is still missing its final grade. But as this historic experiment in governmental intervention draws to a close, one thing is clear. Born of the equally historic housing collapse, the plan shaped the post-collapse financial landscape and demonstrated the power of the central bank to create change both at home and abroad.